This post assumes that you agree that collaborative/group work is a good method of online learning and that effective learning takes place when the individuals involved are part of a community. The ideas in this post are as a result of some in depth discussions with members of emerge. This post is not very well put together in it’s use of terms like ‘community’, ‘group’ and ‘collaboration’ but I hope you can see the basic principles I’m trying to work with. Too much structure = restriction on community formation, groups stay in pre-defined ‘networks’ and do not thrive? Too little structure = lack of direction, lack of coherence, community less likely to form? We agree that it’s not possible to mandate a community but we understand that a community forms only when certain structures are in place. We are not sure exactly what those structures should be or who should be responsible for putting them in place(?) We are also not sure how much structure should be put in place by the educational institution or tutors and how much space/flexibility should be provided for the students to experiment with. Where should the structure come from to encourage a successful community? How much should come from the facilitators within the community? How much should come from the members of that community? How much should come from the nature of the tools used by that community? What is the difference between a facilitator and a member? Can one become the other? In a community are we always both? The rise of web2.0 and immersive environments brings the above questions to the fore. I think that it has only recently become practical for elearning to be relatively unstructured online as social networking etc has become more main-stream. We can see the emergence of online communities and the significance this has for learning but we don’t know precisely how to encourage the formation of communities (It may in fact be more of a craft skill than a science). We can see how engaged, motivated individuals are keen to communicate collaborate and participate, thereby forming communities (emerge is a good example) but we aren’t sure how to encourage/lead a bunch of slightly alienated first years to act in a communal manner. I would argue that innovative work/research in elearning needs to find answers to the questions posed above. ‘Next generation’ elearning will increasing be about managing and facilitating collaboration and communities, about encouraging cohorts of students to move from being an institutional defined network of individuals to members of learning communities that reach beyond traditional institutional boundaries. So, what would an attempt to answer these questions look like as a ‘project’? Well here is my first, very sketchy attempt to outline one possible route. The focus would be on Second Life in this particular case but with the understanding that any educational activity in SL will probably actually be overseen by associated 2D systems (Moodle, FaceBook etc) As I mentioned in an earlier post I think that most healthy communities exist in more than one tool or environment. i.e Emerge uses Elgg, Elluminate Skype Email etc. The community has the same relationship to a single tool as a virus has to a single host. If the tool creates the right environment then the community will grow stronger. It will have stronger bonds and will potentially expand in numbers. As the community evolves it will move hosts/tools or at least shift its emphasis within a group of tools. For example moving from a Blog focus to a Skype focus and back again as ideas circulate. Clearly it would be a good idea to look at other successful online communities to try and discover what kind of structures they have put in place. It would also be useful to gather together examples of current good/successful practice of teaching/group work in Second Life. Next we would plan a series of group/collaborative activities that range from the highly structured (eg step-by-step with a tutor) through to the open (eg form your own group and build a demonstration of a scientific principle of your choice). We would then put a range of students through these activities to discover which combination of students and activities fostered community like activity. The main outcome would be guidance on how to encourage online community and how best to run collaborative activities in an immersive environment. An ideal result would be a series of activity models that gradually move from the structured to the unstructured and draw a cohort of students through to a point where they are a relatively self-supporting community. We could learn from the gaming community in this respect. 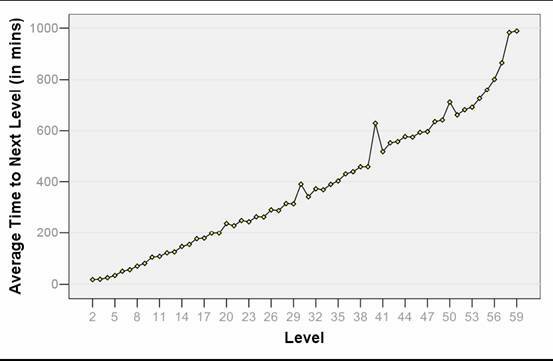 Below is a chart that shows the amount of time it takes to reach each ‘level’ in World of Warcraft. As you can see the time/effort needed rises fairly steadily from level to level. This is good game design, could it be good course design? The game has the advantage over a traditional course in that there are explicit rewards every other level (spells, amour etc) is there an educational equivalent?